The Jewish population of the Lower East Side has largely moved into what were much nicer neighborhoods at the time. Economic success would allow a family to move out of the tenements after a number of years. For several decades the process continued, with new immigrants taking the place of those who moved out. Then the Immigration Act of 1924 suddenly cut immigration to a tiny fraction of what it had been. Its main goal was to severely limit immigration from Southern and Eastern Europe. It almost eliminated immigration from Africa, and banned all immigration of Arabs and Asians. The U.S. State Department says that its purpose was "to preserve the ideal of American homogeneity." Up In The Old Hotel is a wonderful book by Joseph Mitchell. In 1929 he moved from a small farming town in the swamp country of North Carolina to New York City, where he became a reporter and feature writer. He wrote for The World, The Herald Tribune, and The World-Telegram. Then in 1938 he took a job with The New Yorker, where he stayed for the rest of his career. Up In The Old Hotel is a collection of Mitchell's pieces for The New Yorker. In a 1942 piece titled "King of the Gypsies" he describes a "small, poor Russian Orthodox Catholic church" on Seventh Street, between First Avenue and Avenue A. He says, "It is the mother church of all the Russian gypsies in the East and is used by those of other nationalities." The Gypsy leader profiled in the piece says "We never go to church except for Easter and for funerals. We just ain't godly people." The Russian Orthodox church on 7th Street between First Avenue and Avenue A. In 1955 in "The Gypsy Women" Mitchell writes about his talks with a New York Police Department detective. The detective is describing the vistas or bands of Gypsies, of which the largest in New York was a Russian vista calling themselves the Frinkuleschti. He says, "There've been twenty-five or thirty Finkuleschti families holed up in the city ever since the depression, and a good many others come and go. You'll always find some in Brooklyn, usually in Red Hook, the Navy Yard district, or Williamsburg, but they mostly live within twenty blocks of each other in a section of the Lower East Side that's the gypsiest section in the city. The section is bounded by Houston Street, the Bowery, Canal Street, Pike Street, and the river, and families belonging to a dozen or more vistas live in there. Congregation Masas Benjamin Anshe Podhajce was organized in 1895 by immigrants from the village of Podhajce in the region of Galicia. That region was part of the Austro-Hungarian Empire before World War I. At the end of that war, it became part of Poland. After World War II, the village was now the Ukrainian town of Підгайці or Pidhaitsi. A Jewish community existed in Podhajce at least since the 16th century. The Tatars invaded in 1667 and massacred many of the inhabitants. By the 1760s the population had grown back to 1,000, and the Jewish population increased further under Austro-Hungarian rule through the 1800s. Anti-semitism and economic problems drove emmigration to the U.S. in the early 1900s. The Jewish population back home in Podhajce had grown to about 6,000 by 1910, but by 1931 it was back down to 2,872. In 1942 the Nazis removed the inhabitants who remained in Podhajce, shipping them to the camp at Belzec for extermination. 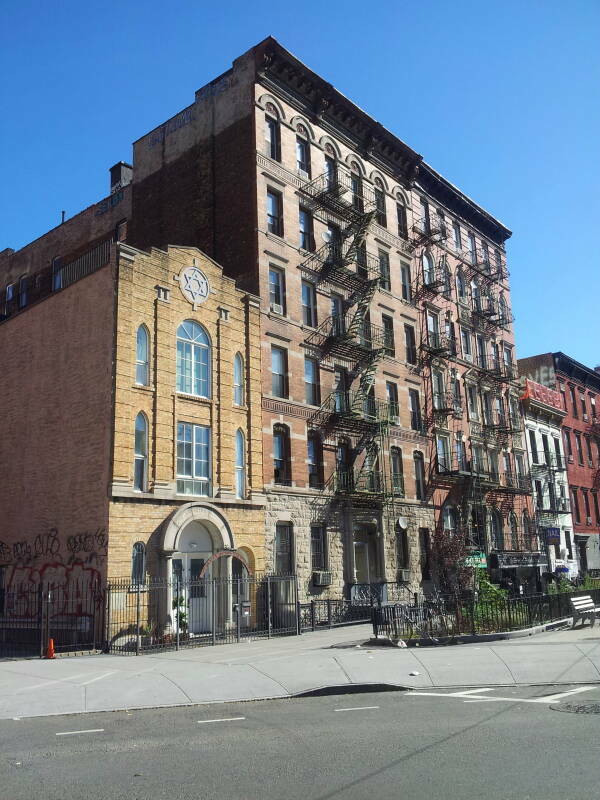 In 1926 the congregation on the Lower East Side bought a three-story building at 108 East First Street. This is at the east end of First Street where it now blends into Houston. 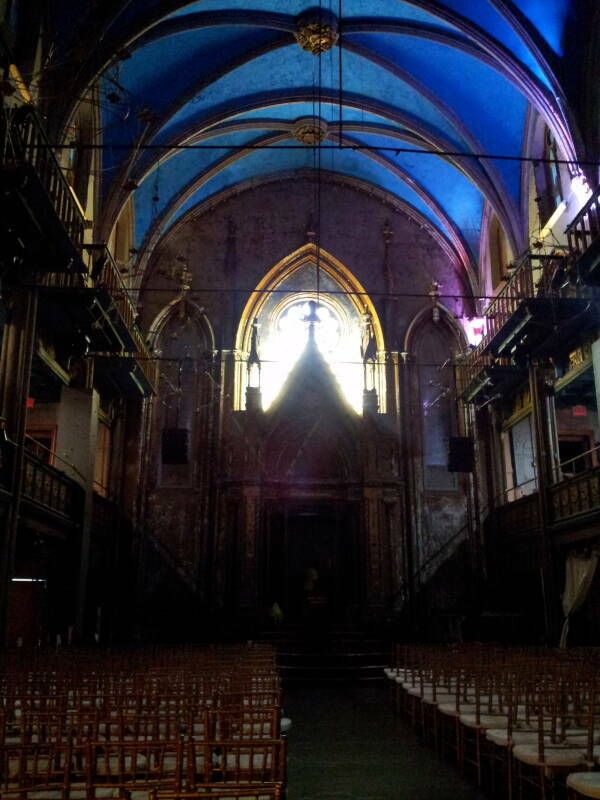 They rebuilt the building as a synagogue, with a two-story sanctuary with stained glass windows and a skylight. 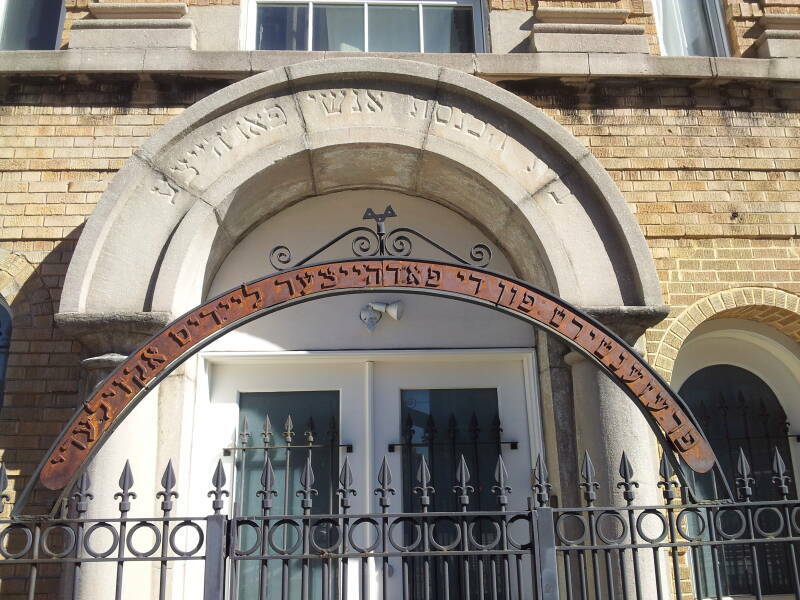 The front gate reads "Contributed by the Podhajce Ladies' Auxiliary" in Yiddish. By the early 1980s this synagogue was being used by Congregation Kochob Jacob Anshe Kamenitz-Lit, formed by immigrants from the village of Kamenitz in Lithuania. It was unused from about 1985 until 1990, when Congregation Beth Yitzchok began using it. 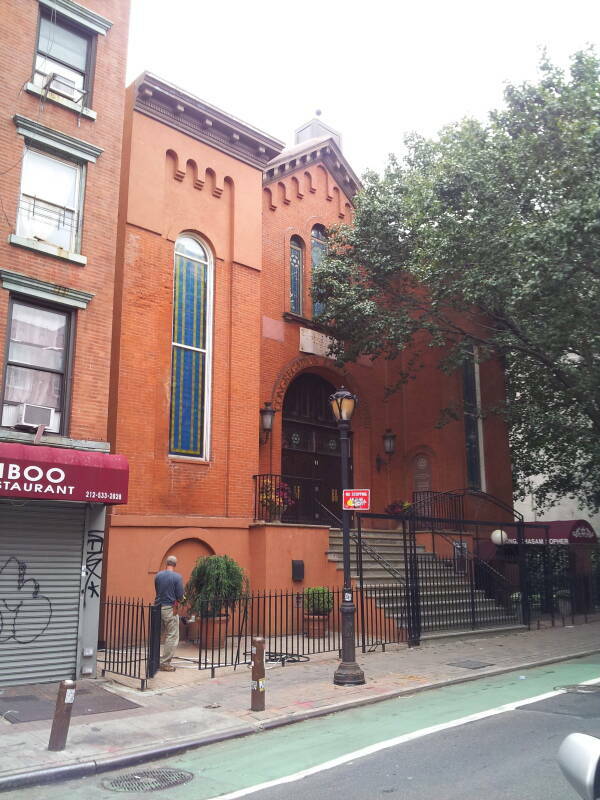 The German-Jewish Congregation Rodeph Shalom built this synagogue at 8 Clinton Street in 1853. 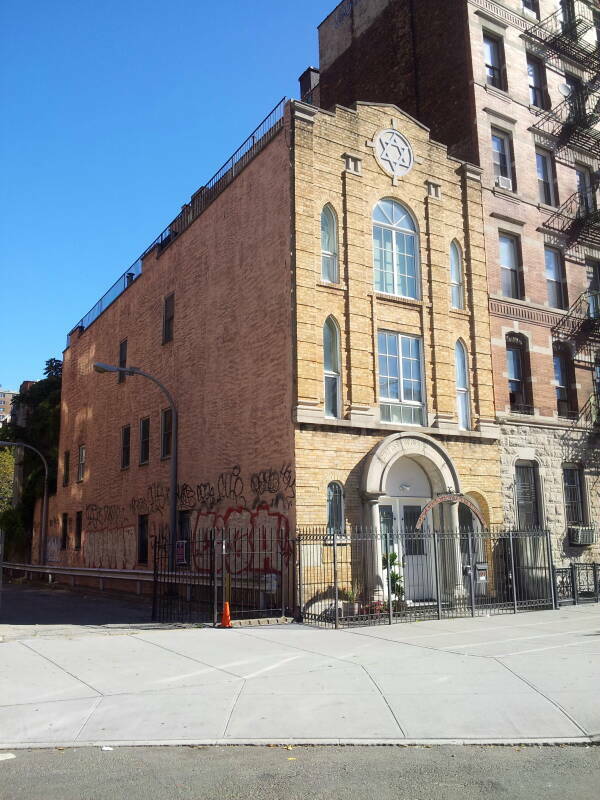 That congregation joined the Reform movement and moved to the Upper West Side. In 1892 two congregations of immigrants from Poland merged into Congregation Chasam Sopher, "The Seal of the Scribe". They bought the building, moved in, and are still there. 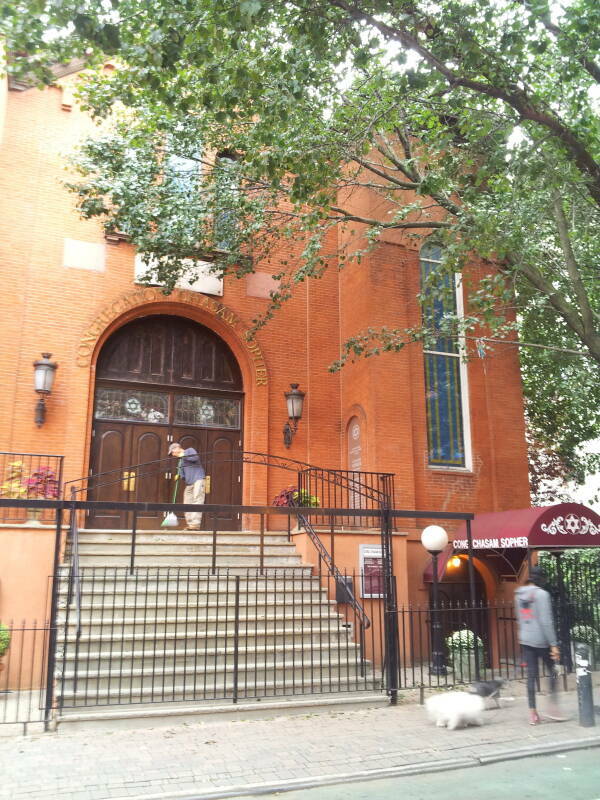 This is the second-oldest synagogue building in New York City, and the oldest still in use in New York State. 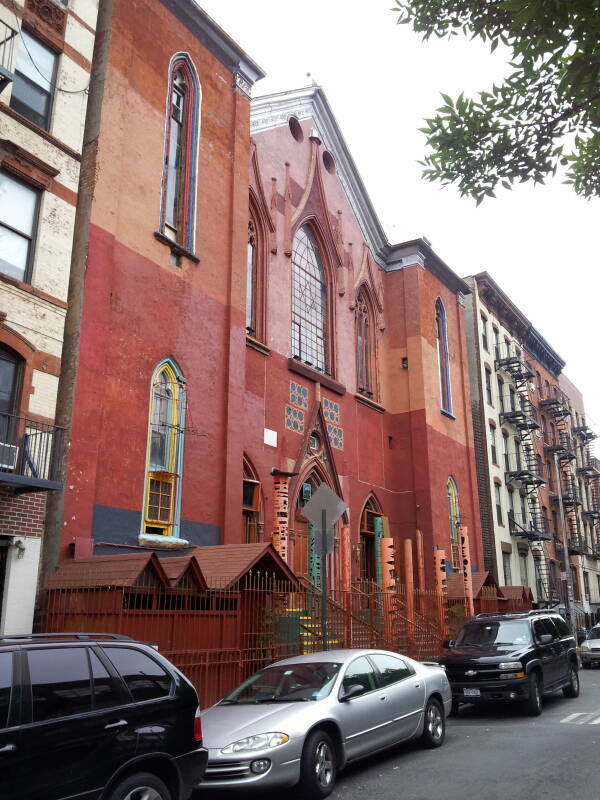 This synagogue was completed by the Congregation Ansche Chesed, the People of Kindness, in 1849. 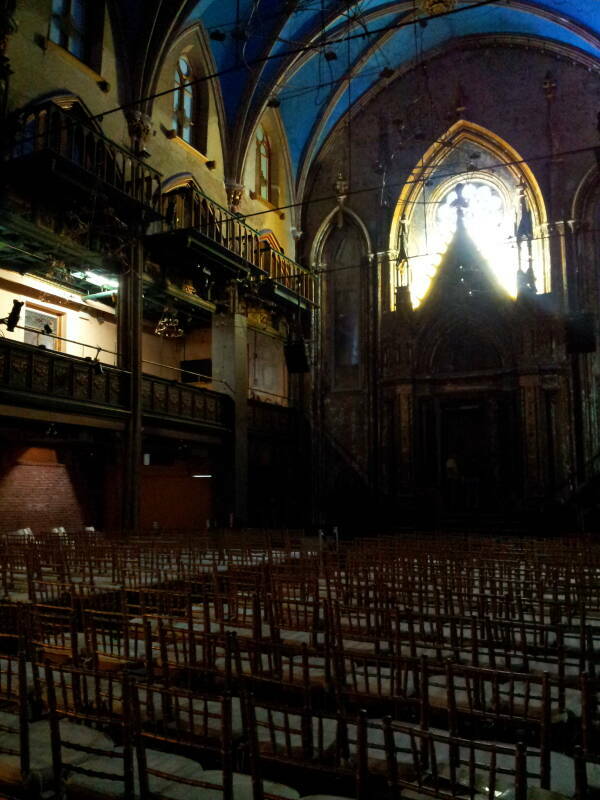 That makes this the oldest synagogue still standing in New York. The congregation had been organized in 1825, mostly of German immigrants but also Dutch and Polish. The area was predominantly German in the early 1800s, when it was called Kleindeutschland or "Little Germany". Its designer based the structure on the Cologne Cathedral. 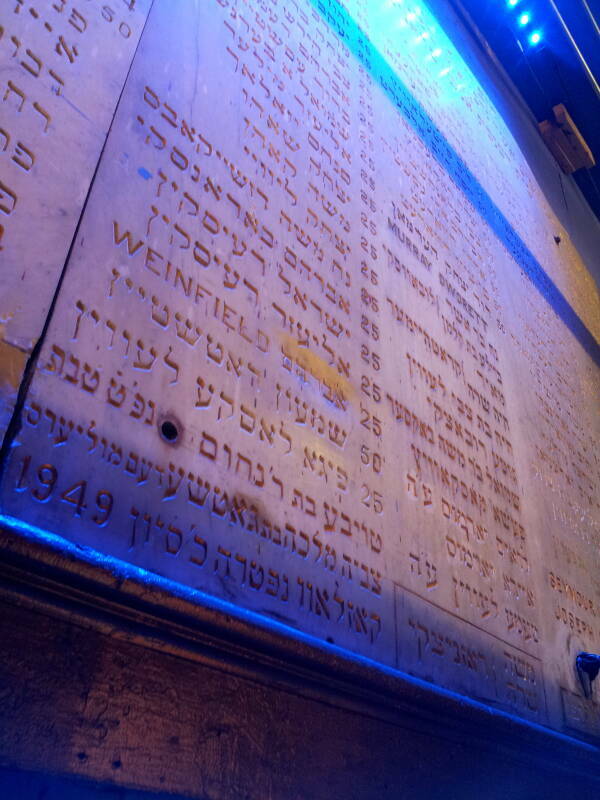 It was the largest synagogue in the country, holding up to 1,500 worshipers. 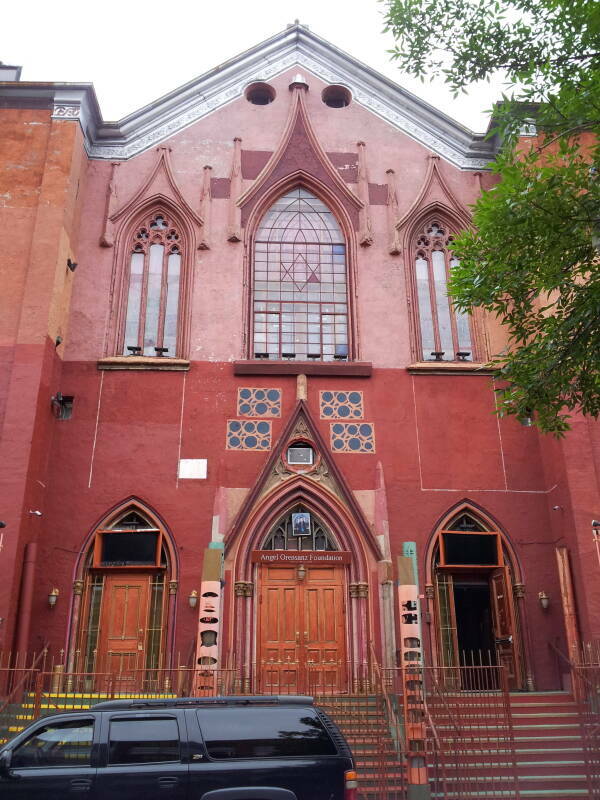 The original congregation moved uptown to a new synagogue at Lexington Avenue and East 64rd Street, becoming Congregation Beth El. They sold this building to Congregation Shaari Rachmim in 1873. 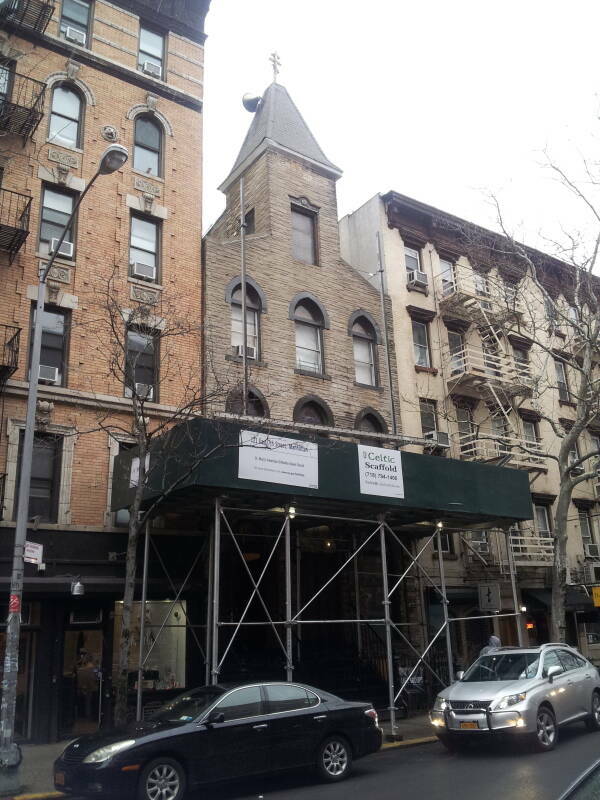 Shaari Rachmim moved to the Upper West Side and sold the building to the First Hungarian Congregation Ohab Zedek in 1886. Then they sold it to Congregation Sheveth Achim Anshe Slonim, founded in 1921 in Slonim, Belarus. 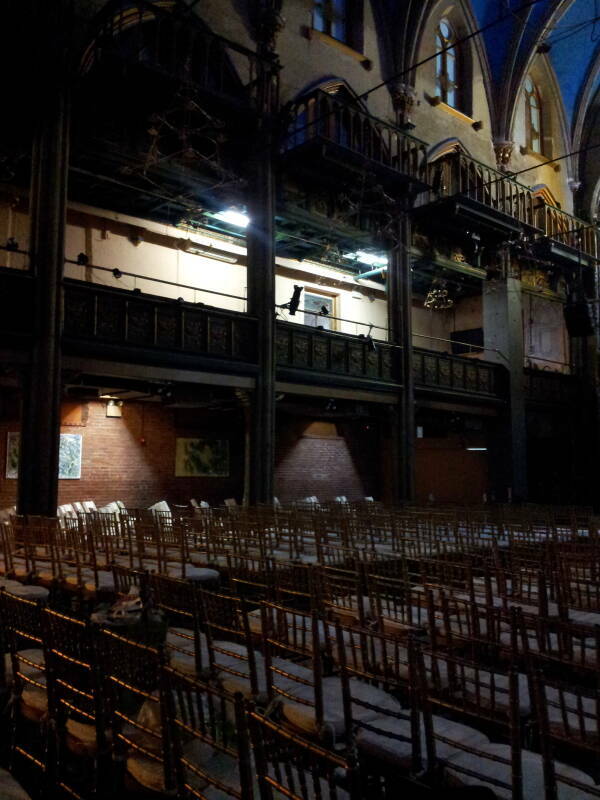 Angel Orensanz Foundation at 172 Norfolk Street. By the early 1970s that congregation had dwindled. It was disbanded, and the building was abandoned and repeatedly vandalized. 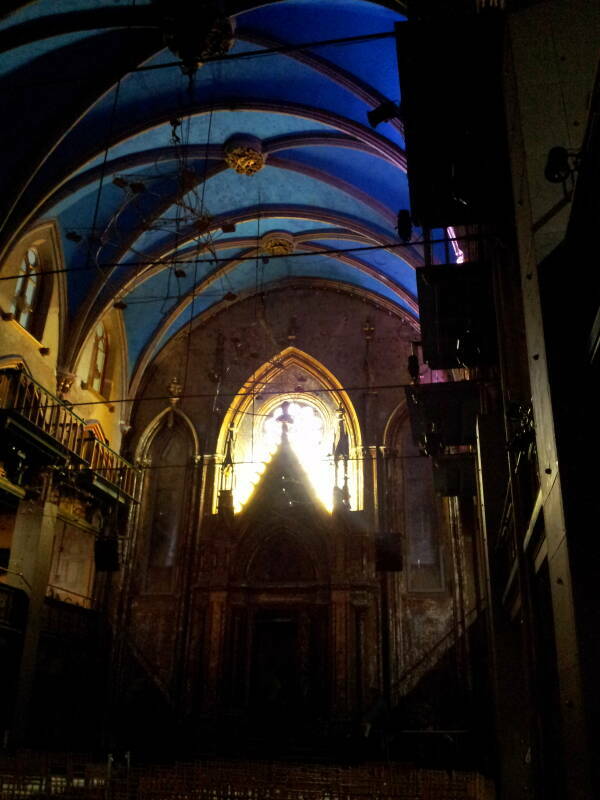 In 1986 the Spanish sculptor Angel Orensanz purchased the building, repaired it, and made it into an art studio. It now hosts a wide range of cultural programs, occasional shabbas services, and weddings and bar mitzvahs. A small Orthodox congregation worships in the basement every Saturday. Stanton Street and Rivington Street run east to west across the Lower East Side, and a number of historic buildings can be seen along them.